The Met's "must-see" Simon Boccanegra was high on my spring wishlist, but I didn't make it down until the penultimate performance on Tuesday night. Giancarlo Del Monaco's production was heavy with wood, stone, and velvet. I do have a soft spot for fourteenth-century costumes, but the hyper-realism (especially of Amelia's garden and the Genoese council chamber) was a bit much for me. And we never see the sea! Of course, I'm spoiled, because my first acquaintance with this opera was made through a Christof Loy production (Frankfurt, 2007) I wasn't nearly well-informed enough to appreciate properly. Feel free to hate me for that; rest assured I am properly ashamed. On Tuesday, the Personenregie, or lack thereof, was an even bigger problem for me, with stand-and-sing delivery and semaphore-stylized gestures. It was, then, All About The Singing. Fortunately, this was strong. The chorus was great, with incisive diction and simply thrilling sound. In Act I, Scene 2, their off-stage cries built in urgency until they finally erupted into the council chamber - brilliant. Nicola Alaimo, as Paolo, seemed a bit "off" to me at first, perhaps riding close to the bottom of the pitch, but his voice warmed up considerably over the course of the opera. Also, the student tickets which the Beloved Flatmate and I secured put us in the orchestra but back under the overhang, and I'm not sure how that affected my perception of sound. Barbara Frittoli's Amelia struck me as rather bland. Perhaps her voice would have made a stronger impression in a different role. At the outset, especially, she had a noticeably wide vibrato, and seemed less than secure at the top of her range. When these problems were smoothed out, she sang an Amelia of considerable beauty--her "Pace! Pace!" was exquisite--but without much vocal or dramatic individuality, I felt. Ramon Vargas sang with creamy tone, and charmed with a sweet, sympathetic persona. It was very hard to picture his Adorno as a rabble-rouser; he's just an impetuous chap, going around singing charming canzone about how much he's in love. He sang with elegance, as well as warmth, and enough expression to give his Adorno some dramatic bite despite the limitations of the blocking. 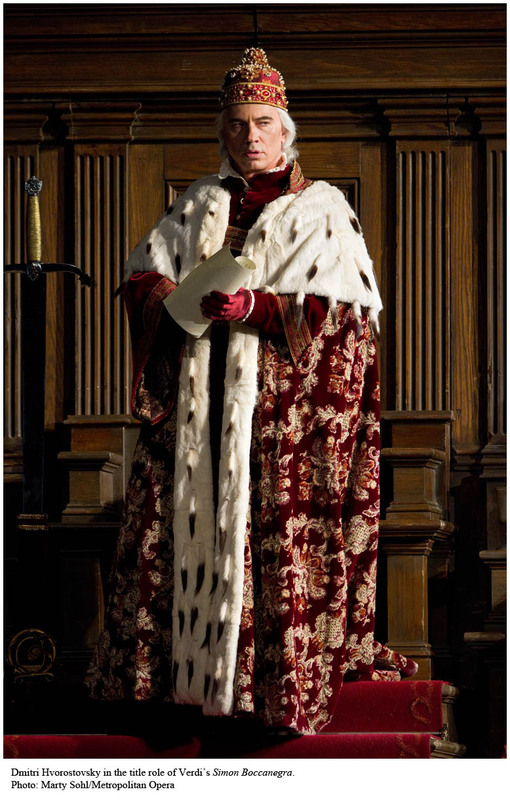 Ferruccio Furlanetto combined Fiesco's nobility and ruthlessness with masterful ability. His snarling disconcerted me, but I concluded it must have been purposeful, as he also consistently created amazingly beautiful, full sound, with thrilling lows. Through superlative musicianship, Furlanetto created a Fiesco of tragic stature. In the title role, Dmitri Hvorostovsky made a remarkably successful departure from his usual persona of Smoldering Baritone. His sensitive characterization made Boccanegra noble throughout, ageing credibly, and giving the corsair-doge an edge of fiery temper that makes it clear his wisdom is hard won. His voice lacks the heft I mentally associate with that elusive creature, the Verdi Baritone, but his gorgeous tone was wielded with great intelligence. He was at his best in the lyric passages, where he shaped phrases beautifully. His expressive singing served him well in evoking the doge's anguish, anger, joy, and, finally, spiritual peace. On a superlatively strong night, it was still the world-class orchestra who emerged as the star. Under Levine's leadership the score was treated with subtlety and restraint which nevertheless did not shirk the thunderous drama of the climaxes to the prologue and Act I. The emotional resonance of the repeated themes was beautifully captured. And although the sea was never seen, its cool breezes and eternal tides were certainly in the orchestra. The audience's applause, warm for all the principals, turned rapturous for Maestro Levine, which was acknowledged with a cheery waving of his cane. Glad you finally made it. As it happens, the fates blew me into the Met last night for a second looksee and while I can add nothing to your superb description of the proceedings there are a couple of comments on some of your observations. First the stand and deliver element is unfortunately unmissable, and most unfortunately so in the case of Frittoli. The stock arm gestures are somewhat annoying and especially so as Frittoli can be a very effective, spontaneous natural actress and that even in fairly old and not especially distinctive productions. For this reason I'm a inclined to blame the production but cannot absolve her entirely as she was the most guilty party in this case and Hvorostovsky especially managed to present, as you say, a superb dramatic portrait. Regrettably, your description of her voice is also exactly right: some unsteadiness - I would say even some harshness - at the beginning and very evident improvement (although several rather intrusive breaths) but at no point in the evening real vocal distinction. Last Friday, by contrast, the entire performance - although it also improved throughout the evening* was on a much higher level, with some gorgeous spun Verdian lines (and the absence of the above mentioned breaths), liquid tone and a distinctive vocal character. I mention this only because I'm a huge Frittoli fan and root for her. She's been less than consistent and severely criticized the last couple of years and I was pleased based on the reviews that she seemed to be doing very well and was happy to observe that in person last Friday. I'm sorry you didn't have the chance to hear her at her best. Vargas by contrast was excellent on Friday but even better last night. Lastly, the 14th Century scenery and costumes were punctuated by what, I think, was sorta 16th (maybe early 17th Century armour - execept for Vargas's somewhat Roman(?) getup. *"Come in quest'ora bruna" is a devilishly hard aria especially from a standing start - as it were - but is also one of my absolute favorites. Both it and "Ella giammai mamo" are annoying in that on the one hand the orchestral preludes are stunningly gorgeous and on the other I'm always impatient to get to the aria proper. **There's a lot to be said about Furlanetto but I'll try to abstain. @marcillac: I'm glad to hear that about Frittoli, and I certainly didn't wish to seem "down" on her. I'll have to hope to hear her again in more auspicious circumstances. I agree that "Come in quest'ora bruna" is hypnotically lovely as well as so very difficult. The armor did seem late, but vigorous trade, and sumptuary laws, made for rapid change in style of dress around this period, often distinct by region, and I would not venture a confident opinion. From what I do know, Vargas' costume seemed typical enough for late medieval ceremonial armor... definitely with classical influence. OK this is off topic but you may be interested: I was trying to find out when this BFO Don Giovanni is happening and I discovered it is going to be on August 2 and 4. It was to feature Juliane Banse as Donna Elvira but she is schwanger so it will not. That's all I got. My Google is predisposed to results in German, which may not have helped me find stuff. Also, I can't believe they covered up Hvoro's hair. And I really like Levine in this opera and am jealous you got Furlanetto as Fiesco when I had to deal with Morris last season. are you going to see Nixon in China? @Zerbinetta Info appreciated! You did better than I did with the .com version of Google. I know, outrage to the Hair! And... yeah, sorry. I don't know how the Met got Furlanetto for two Verdi operas this season, but, awesome. @asperias Not at all. I am planning on going to see Nixon; when I do so will depend somewhat on the plans of out-of-town friends. On my blog I expressed regret at not getting to see this cast. Now it's even worse. Sob. @Dr. B. I offer commiseration and apologies for exacerbating anguish, but realize that these are poor substitutes for an HD transmission. You know something Lucy, @$&# it. As you can see in this video "classical influence" - yes, even remotely Roman - no. And the worst part is that we sat in the 1st row* on Tuesday. And you want me to be able to tell the color of Mattila's dress. ** Ha. *I just got a new prescription for my glasses last year - the adjustment was slight but if I'm not completely blind ... oh never mind. **Actually I started the whole kerfuffle but lets not cloud the issues with responsibility - things are fuzzy enough as it is. @marcillac Oh dear, I am sorry to hear of optical difficulties. Thanks for sharing the gorgeous clip!